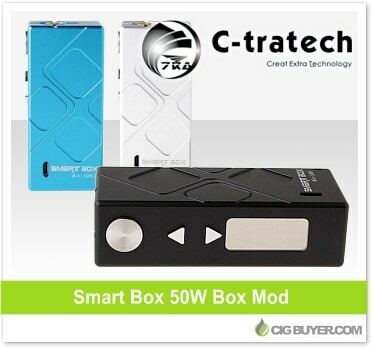 We shared the Smart Box 150W Mod earlier this week, but Chinese manufacturer C-Tratech also has a smaller version – the Smart Box 50W Mod. They appear to have the same operating systems, but the 50W version takes a single 18650 battery and is obviously less powerful and more compact. It offers plenty of output for most vapers (up to 50W), includes a nice OLED screen, adjustable 510 center pin and will fire atomizers down to 0.25 ohms.